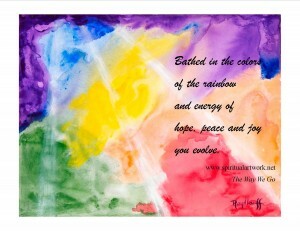 The colors of the rainbow provide nurturing energy. Speaking from experience, losing a job, the loss of sight in one eye due to an injury and major family upheaval, I can personally tell you it makes a positive difference in your life. I have not only re-discovered that silver thread of deep spiritual connection but found that it provided me with the eternal hope of better days ahead plus the strength and wisdom to move forward. Transition is always a difficult time for most people. It almost always means change – mental, physical and emotional. Depending on how invisible your silver thread, or weak your faith, your spiritual connection is eternal and something you can always depend upon. We are all on a journey, just in different locations on our path traveling at a different speed. It isn’t about how fast we travel but about the journey itself and what we experience and learn along the way. To help you start or re-start down your path to creating a better more hope filled tomorrow try some of the following – they will make your day go more smoothly and leave you feeling better about tomorrow. Surround yourself daily with the colors of the rainbow. Each color carries spiritual energy and nourishes the heart and the soul. Calm your mind and still your heart – pray, meditate or quiet your thoughts. Allow the eternal spiritual connection to the Creator give you strength, wisdom and encouragement for moving forward. Keep a journal and jot down all positive thoughts while in your quiet space. You will be amazed at the problems you solve and the ideas that flow into your being. Have you found your silver thread that leads to a deep abiding spiritual connection to your Creator?